Look what I got for Mother's Day!!! According to Williams-Sonoma it is called a Molcajete! 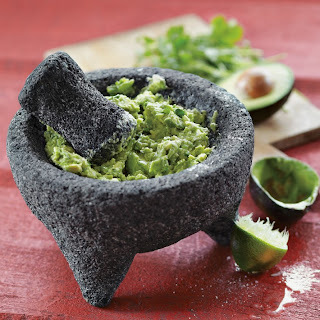 I didn't even know I needed a molcajete, but according to my son, I did! I have made more guacamole in the last month than I ever have, and guess what? It is SO much easier with the molcajete! It is supposedly made out of lava rock, and it's rough texture makes it unbelievably easy to mash the garlic and avocados. And total bonus, the guacamole looks so cute served in this molcajete! It is a little bit of a pain to wash, but in my opinion, it is totally worth it! How do you make your guacamole? Do you use a molcajete? Did you even know that you need one? Trust me, you do!! !